In creamy Rose Deodorant, used a carefully formulated combination of gentle, deodorizing and nourishing ingredients. Rose water lends an elegant, delicate fragrance while Alchemilla essence helps to gently regulate perspiration. To top it all off, when essential rose oil meets high-quality jojoba oil, the skin receives an exceptional kind of care that one can’t help but feel happy about. Low alcohol roll-on is especially suitable for normal to sensitive skin. It has a harmonizing effect, contains no pore constricting aluminium salts and does not stain your clothing. Ingredients: Water (Aqua), Simmondsia Chinensis (Jojoba) Seed Oil, Alcohol, Manihot Utilissima (Tapioca) Starch, Glycerin, Zinc Ricinoleate, Ricinus Communis (Castor) Seed Oil, Glyceryl Caprylate, Rosa Damascena Flower Water, Rosa Damascena Flower Oil, Fragrance (Parfum)*, Citronellol*, Linalool*, Geraniol*, Eugenol*, Limonene*, Farnesol*, Citral*, Benzyl Alcohol*, Alchemilla Vulgaris Extract, Cetearyl Alcohol, Cetearyl Glucoside, Hectorite, Xanthan Gum. 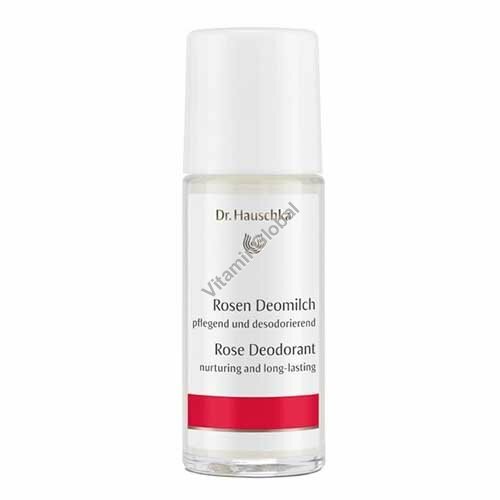 Usage: Apply the Rose Deodorant to the underarms using a gentle back and forth motion. Repeat application as needed.